As our temps start to rise, more Central Texans will be swimming. And while it’s an excellent workout for the entire body, if you haven’t been in the pool since last summer and start full-on sprints in the lap lane, you could find yourself in deep water with an injury. The most common injuries are to the shoulder/rotator cuff and lower body extremities. Shoulder impingement, or swimmer’s shoulder, occurs when tendons become inflamed or irritated due to overuse. This could stem from swinging your arm up over your head as you complete a stroke. You could also hurt your knee or hip joints – also from overuse from kicking. Start doing focused exercises targeting the shoulder at least ten days to two weeks before hitting the pool to build up strength. Before getting in the pool, warm up with light stretches, or something like jumping jacks. Consider meeting with a certified swimming instructor for a few sessions to get feedback on your strokes. 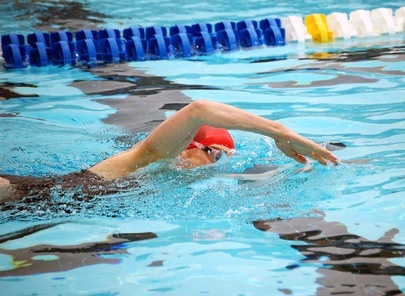 Alternate your strokes every few laps to give your body a break by activating different muscles in various sequences. Take regular breaks from lap swimming, every few days, just as you would with any other sport to let your body rest and recover. Fill in non-swimming days with walking, slow running, or cycling. Always make sure there is a lifeguard present, or someone else around. Wear properly-fitting goggles and ear plugs to protect eyes and ears from infection or irritation from the chlorine. Don’t forget to use waterproof sunscreen, and reapply often. Avoid swimming if you are sick, overheated, chilled, or exhausted. If you experience any pain in your shoulders, knees, or hips from swimming, please contact us for an appointment.